An elegant, ornate design makes these glass ramekins sparkle like cut crystal. Glass ramekins make an ideal complement to any high-class dinner service. Use convenient ramekins for serving condiments or small treats. 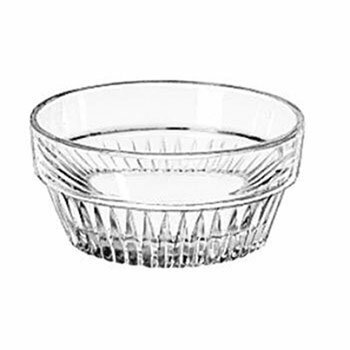 Dinnerware Type: Ramekin; Material(s): Glass; Capacity (Volume): 3 oz; Shape: Round. Ideal for high-class dinner service. Use it for condiments and small treats.